Set against a pending religious war and invasion, Broken Justice presents a living, breathing world where there are no easy answers. Like the works of George R.R. Martin, it is unflinching in portraying the darker side of human impulses, but instead of focusing on the political games of royalty it explores the moral conflict and emotional trauma created by the struggle of building a life in a hostile world. The setting may be fantastic, but the struggles of each character are realistic and relatable to any reader. Broken Justice seeks to be more than just a sword-and-sorcery page turner. While we endure devastating battles alongside the characters, witness the epic wonders of an ancient world, and experience just a bit of magic, D.W. Craigie also asks us to think deeper. Could you kill someone in hand-to-hand combat? Once you strip away things such as language and culture, are we that different as people? Why must we fight just because we are different? While Craigie puts forth these questions in his writing, no easy answers are provided. The readers, much like the characters of Broken Justice, must find their own way. 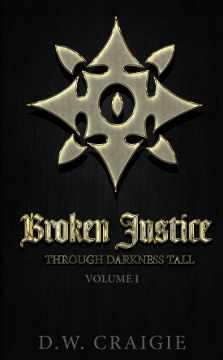 Written with the intention of breaking fantasy conventions, and influenced by the turmoil running rampant in our own world, D.W. Craigie presents Broken Justice: Through Darkness Tall - Volume I.